Hakusan, Japan, October 29, 2014 – EIZO Corporation (TSE: 6737) announced that the DuraVision FDF2304W-IP 23-inch IP monitor for security and surveillance will be updated to support the Open Network Video Interface Forum (ONVIF), a global standard for the interface of IP-based security products. 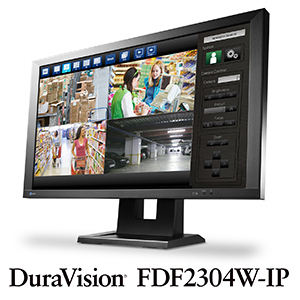 The DuraVision FDF2304W-IP features connection to multiple IP cameras via LAN cable for efficient video monitoring without the need for a PC. The monitor was launched in February of 2014 supporting compatibility with Panasonic brand cameras. With the update, ONVIF support broadens compatibility to extend to other major global camera makers including Axis, Bosch, Sony, and JVC. * Expanding the range of cameras usable with the monitor increases flexibility of installation and ensures interoperability with more products for secure investment. Five different video layout options are available for viewing video feed from a single camera at full screen, or up to 16 cameras displayed on the screen simultaneously. The included remote control allows live adjustment of camera settings for flexible control such as camera brightness, focus, zoom, pan, and tilt. The DuraVision FDF2304W-IP is equipped with EIZO’s Smart Insight technology, which automatically detects areas of the screen that are too dark and difficult to see and adjusts the brightness of each pixel. This produces highly visible images by brightening dark areas and keeping light areas from becoming washed out, preserving a realistic sense of depth in the image. The monitor’s Smart Resolution blur-reduction technology corrects blurred areas without over accentuating noise for a sharper, clearer image. In addition, noise-reduction technology minimizes the amount of block noise resulting from video compression. The DuraVision FDF2304W-IP reproduces smooth images by converting an 8-bit signal to 10 bits within the monitor and selecting the optimum color values from a 10-bit lookup table (LUT). The optimized data is then converted back to an 8-bit output signal, resulting in smoother gradations. For clear video reproduction, an overdrive circuit accelerates gray-to-gray response time to just 8 ms, minimizing ghosting and blurring during high motion video capture. The LED backlight has a wide dimming range that is adjustable to as low as 0.6 cd/m2. This makes it more comfortable to use the monitor in dim or changing ambient lighting conditions. The monitor also utilizes a hybrid solution to regulate brightness for flicker-free images. This greatly reduces eye fatigue when viewing the screen for extended periods of time. The DuraVision FDF2304W-IP with ONVIF support will begin shipping in January, 2015. Availability varies by country so please contact the EIZO group company or subsidiary in your country for details. Click here for camera compatiblitity information.